Ever since A Life Less Ordinary, I’ve been intrigued by its director: Danny Boyle. Each movie he makes seems so different compared to the others, but I always feel he has an interesting story to tell. And I have to say this is one intriguing little movie. Slumdog Millionaire opens with our main character Jamal being interrogated by the Mumbai police, who think he has cheated on India’s version of Who Wants To Be A Millionaire? Jamal is only one step away from winning the main prize of 20 million rupees, and the police don’t believe he could have known all the answers. As the inspector says, if even doctors and lawyers can’t reach that final question, how could Jamal, a slumdog from the poorest parts of Mumbai, know them? Desperate to prove his innocence, Jamal tells the tale of his life and how each answer to the questions in the games show is interwoven in a chapter of his life. Some people will tell you this film is amazing and that it should win Best Picture at the Academy Awards next year. And they may very well be right; Slumdog Millionaire does feel like the type of fair Oscar voters will gladly bite into and from whatever other films that might be nominated (you know I’m not the Oscar loving type) I’d like to be rooting for this one. I think the best way to describe the movie is this: Take City of God. Change the setting from Rio De Janeiro to Mumbai. Add more hope and positivity, and a touch of love. And you’ve got Slumdog Millionaire. Like City of God, this movie gives a realistic view of the slums in Mumbai and it can be grim and depressing at times. You really have a feeling as if you’re seeing a side of Mumbai which is normally not seen. Unlike City of God though, there remains a ray of cheeriness and optimism throughout the entire movie. I don’t want to say this movie is amazing. Cause to be honest, I didn’t find it a-m-a-z-i-n-g. The plot feels a bit too coincidental (the way every question ties in with part of his past), while it could have been done slightly more subtle. On the other side though it’s gotten really stuck in my head and I keep thinking about it. 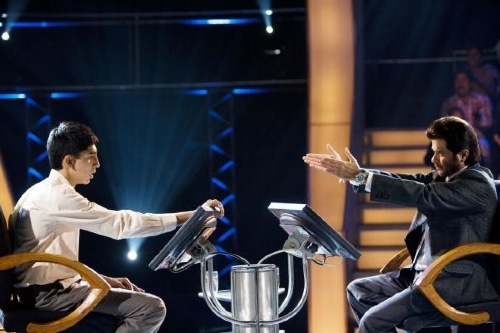 At it’s heart Slumdog Millionaire is like a fairy tale and you just can’t help liking it. That being said, Slumdog Millionaire is definitely a film you should watch in the cinema. It’s got more heart and charm than other movies you’ll find currently there and I won’t be surprised if it indeed manages to grab that Best Picture Oscar!